What can you do in motorhome when it rains ? Let's briefly review the Motorhome Show, the exhibition dedicated to recreational vehicles that took place a month ago in Paris! Every year, many of you are taking part in this must-see motorhome event. Whether you are an RV enthusiast, a caravan lover or simply a curious traveler, you will discover news and innovations of the caravanning world. Between animations and innovations, conviviality and sharing, this is the meeting not to be missed! 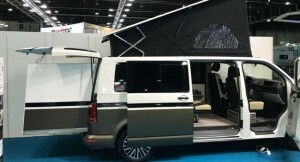 Today, discover our opinion regarding the Paris Motorhome Show and novelties that have impressed the CaraMaps team 🏆 1. The luxurious Concorde Centurion 💎 The Concorde Centurion 1160 GSI is in the spotlight! True truck with a gross weight of 18 tons and a length of nearly 12 m, it combines technology, design and elegance. Plus: garage for a Smart city car Price: from 568 500 € 2. 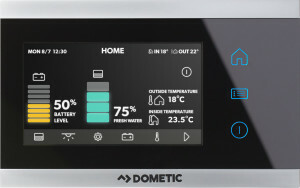 Dometic and the connected motorhome 📲 Dometic Connect, an innovative comfort control system that turns your RV into a connected tool. Air conditioning, heating, lighting and many more… Plus: the elegant and tactile control panel 3. The ingenious “Flex-Van” 👑 The “Lando Brisbane”, the first French van with a slide-out! Van-Volkswagen with an electric extension at the back which allows to increase the length of the model, once stopped. Most: vehicle height doesn’t change Price: about 65 000 € 4. The smart XOR Scooter 🛵 Ideal for city and leisures, this electric and folding motorized two wheelers, fits perfectly in your motorhome. Impressive acceleration, significant autonomy, innovative battery … the first Urban Transformers scooter that fits to your needs! Price: € 6,200 (with battery € 3,100) 5. 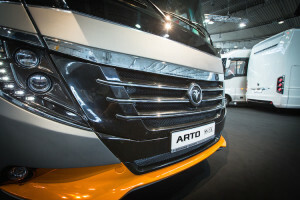 The sporty look of the Arto 88 EK 🏎 With its exterior inspired by luxury cars, the Arto 88 EK of manufacturer Niesmann Bischoff is worth seeing… With a well-sculpted bodywork and an explosive paint, this high-end motorhome reaches 8.76m. 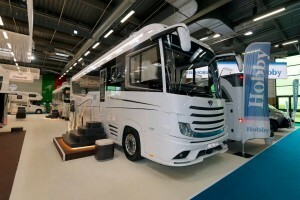 Price: from € 124,990 So as far as you are concerned, what do you think of this motorhome exhibition? Moreover, don’t hesitate to share your impressions, memories, discoveries and pics! Hoping to see you next year at our booth, Have a nice trip with CaraMaps!